'Definitely a Magical & Brilliant Experience' and 'Blown away by all the magic' are just some of the glowing reviews we've received about our WDP Santa Experience this December. 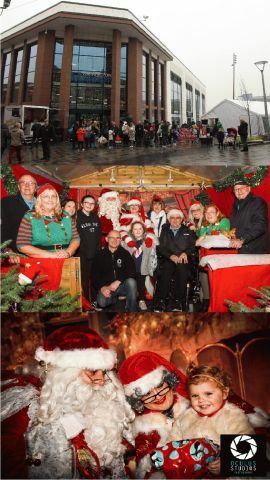 We teamed up with Oculus Photography and Warrington Retail Market to create the ultimate Christmas experience and with the help of our fundraising and community engagement team and many of our amazing staff, volunteers and trustees, we saw a record number of children visit our Santa's Grotto, 1,367 in 19 days. With a record 237 children on Saturday 23rd. Our friends Tony and Julie and their team at Oculus Studios Photography said We had an awesome time at the WDP Santa Grotto this year. Watching all the different reactions from the children when they first spot Santa is amazing! It's been an honour and a privilege to work with the hard working team that is Warrington Disability Partnership and we're already looking forward to working together to make next year's grotto even more successful! We cant wait for you to see what Team WDP has lined up for 2018. As a way of thanks, Tony and Julie gave WDP an amazing donation of £1,365. The Santas Grotto played the main part of WDPS Christmas fundraising calendar that also included: weekly tombolas in the bus interchange, three days fundraising at Sainsburys at Chapelford, a bucket collection at the Winter Wonderland Manchester and Christmas Raffle.